Nokia's 2009 flagship phone offers a little bit of everything. This is a case where more features, however, don't necessarily make for a better phone. If content creation and message making are your primary needs in a cell phone, then the N97 should be at or near the top of your list, that is if you're as wealthy as a king. 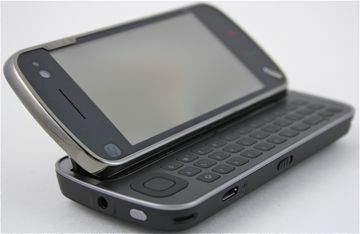 The N97 is of course Nokia's flagship N Series multimedia device for 2009. If you can get past the shocking price tag, there are a lot of powerful tools on board the N97 that make it far more than a phone. Nothing about this seems "Latest and Greatest"
This just seems like a giant stale device from Nokia. They once had the most advanced smartphone platform in existence, and now I'd rank them 4th.. or even 5th. I mean c'mon, how does such a crappy UI even get green lit? They didn't even try. I don't see too many people plunking down $700.00 for a device that gets burned by a $100.00 iPhone. I agree. For the price this will be a flop, now if it was priced right, maybe even in the $200 to $300 range, it may have a chance. There are just to many cheaper phones that offer more then this right now. I've had the N97 for about a week and a half, and I think I'd agree with Eric's overall thoughts on it. After the first weekend, I REALLY liked it. I still do but my enthusiasm has been tempered a little bit. I'm not quite as frustrated with some of the things that Eric is. For example, I have no problem with the touchscreen being resistive because it might be the best resistive touchscreen I've ever used. I'm also a little bit surprised with his complaints about the body. It's disappointing that the N-Series development team has not found a way to equal the products created by its E-Series counterparts but I can't go as far as to say that I think the N97 feels cheap (other than maybe the battery cover).